It's getting near Christmas, so we though not only would we finally record a new podcast, our gift to you, but that we would also fill it with seasonal films. 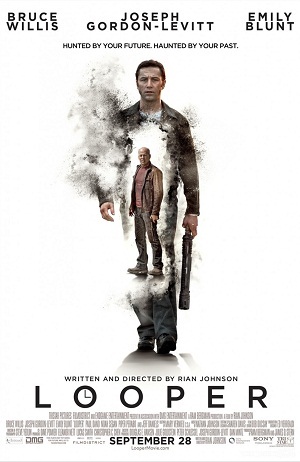 Which is exactly why we reviewed Looper -- a futuristic, time-travelling sci-fi film about hitmen hired to kill their future selves -- and Killing Them Softly -- a gritty, violent, hard-hitting picture centered around a New Orleans mob.So pull up a chair, warm your chestnuts, and spike your egg-nog! Christmas season is here! Blockbuster season is upon us, and we invited Amanda Trice to sit in with us to discuss one of the biggest of the summer. Stalwart leading man Brad Pitt plays the lead in “Tree of Life.” Pitt plays O’Brien, an inventor and thrill seeker. He and his estranged wife, played by Jessica Chastain, get themselves in to a number of ill-advised predicaments in this rom/com/thriller which can only be described as Inspector Gadget meets Mission Impossible. In the middle there’s some sort of hokeyness about our place in the universe, and how we deal with loss, and the nature of God, but that portion of the film is fleeting. Mostly it’s about Brad Pitt fighting dinosaurs.